I am pretty certain that most of the living, breathing, reading world know how I feel about this book. Sufficed to say I LOVED it. 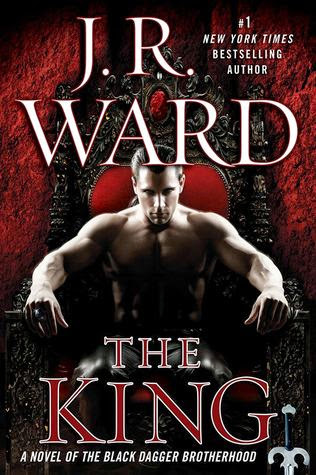 The King takes us back to the storytelling of the earlier Black Dagger Brotherhood books, even with the numerous sub-plots going on, we get back to that grungy hardness that I grew to love in the first Brotherhood books. While there is a lot going on in this book, the main focus and the one that JR Ward gets done so well is the rise of the one true king. Wrath truly comes into his own in this book. He's struggled to find his place in his world, to fulfill his destiny and in The King he finally finds his true power and his place. I love that he does it with Beth, his Shellan, and the Brotherhood beside him and backing him all the way. The King will truly have your feelings all over the place, I know I cried and cheered through it all. It's a gritty book, as is the norm for this series, but at the same time it is going to make you swoon and feel so full of hope. JR Ward also preps us, as she does in each story, for the next book. We get peeks of what will be coming in The Shadows (just like The Shadows gives us peeks at The Beast; Can. Not. Wait.) as well as glimpses into the lives of her vast list of characters. I know that multiple story lines bothers some readers and I will admit it can get confusing and a bit frustrating when you just want to know what is going on with the main couple, but I love these looks into everyone's world. Assail and Sola, that story...I was happy to see it in the book because I love everyone's stories but I am not sure when they will be getting their own book and I'm afraid that by the time their 'big' story comes around I will have forgotten what happens here in The King. I am of course always thrilled to get a look into Xcor's life. I know, I know, you're saying but he's a bad guy, he's so cruel and awful and he wants Wrath dead! All I can say is please don't break my heart, I have such a weak heart when it comes to the underdog and I know he's supposed to be this horrible guy, but I just can't help but kinda love him hard and want him to have this amazing redeeming story. Xor will truly make your heart explode in this book, if you hated him before I think you will at least walk away with a genuine like of him when the end of The King comes. Let me repeat, PLEASE DON"T BREAK MY HEART JR Ward. Beth and Wrath, it's everything. Love, fear, heartache, pain... years of dreams and desires come to a head in this book for this couple. I love how much they love each other, especially Wrath, his devotion to Beth, his fear for her, it is a beautiful thing. This truly is their story (even if we don't have a book that is solely theirs), the depth of feeling we get from them...I can't even describe how emotional it is. Tres, iAm, Selena...I've read The Shadows...I can't say anything right now on this because there is so much to say about The Shadows, just well set up JR Ward. There are so many stories in this one book, so many stories to look forward to and so many stories to get wrapped up in. Don't let that scare you away or reduce your love of the book and Brotherhood. Take each story as what it is, separate lives being lived out simultaneously. This is how the world works, our lives are lived along the side of others and they all intersect. JR Ward's books are like living, breathing entities. They are an entire world that we get to be a part of and watch from above all while feeling like we are immersed into the world of the Brotherhood. I love how with every book JR Ward's couples have us falling more and more in love with them. She has this ability to make us feel their love, she brings them to life, they are compelling, angering, and moving, and I want more. I want it all! If you are a BDB fan you won't want to miss reading this...You can't not read this. I can't promise that you will be happy with it, but you won't want to miss out on seeing Wrath coming into his own and taking his rightful place. If you have not started this series before this is one of the best Paranormal Romance series out there. Do not start with The King however. You must go back and start with book one, Dark Lover. I know you might be cringing because this is a big series, The King is book 13 (and we now have The Shadows, book 14) but every book builds on the next and you want to watch these characters grow and fall in love.